Most of the area remained dry Tuesday afternoon, with showers and thunderstorms staying over central Illinois and Indiana. Skies will continue to clear Tuesday evening leaving us with a mostly clear start Wednesday morning. 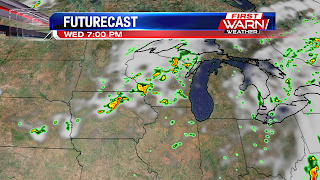 ahead of the front, mostly across Wisconsin, Minnesota and Iowa, Wednesday afternoon and evening. 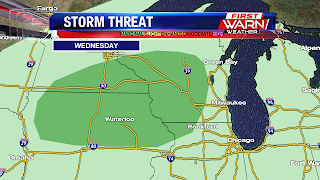 If some of the storms move into southern Wisconsin or far northwest Illinois before sunset, then gusty winds may become a concern for those along and west of a line from Janesville, Durand and Savanna. The cold front will pass northern Illinois late Wednesday night and Thursday morning, settling just to the south during the afternoon. A few isolated showers/storms will be possible during the afternoon but rainfall over the next few days is expected to remain fairly light. Rainfall totals are expected to remain under half an inch (outside of thunderstorms) through the end of the week. It's been a nice break from the summer heat and humidity we're typically used to this time of year, but it looks like the heat will return by this upcoming weekend. 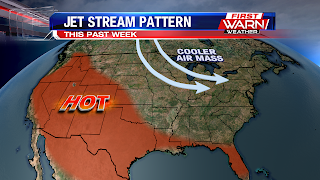 A shift in the jet stream pattern, which has brought record breaking heat to the southwest and up the west coast this past week, will allow that heat to shift east by the end of the week and weekend. Temperatures will remain in the low 80's through Thursday afternoon, but the arrival of a warm front during the day Friday will bring temperatures back into the mid 80's. 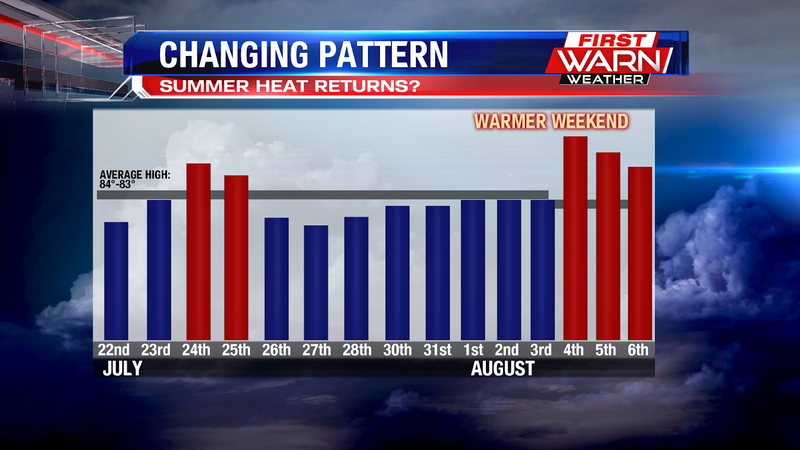 Temperatures reaching 90 degrees are certainly possible beginning Saturday, possibly lasting through early next week. The limiting factor would be any showers or thunderstorms towards the end of the weekend. The main branch of the jet stream will be pushed northward through the weekend, but could remain close enough to keep thunderstorm chances over Wisconsin and Illinois Sunday into Monday. This could limit just how hot it gets during that time. However, if thunderstorms remain limited then temperatures could easily warm into the low 90's through early next week. 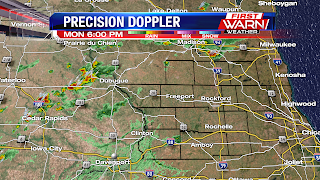 Isolated showers and thunderstorms have developed over Wisconsin, northeast Iowa and northern Illinois and are moving from the northeast, to the southwest. 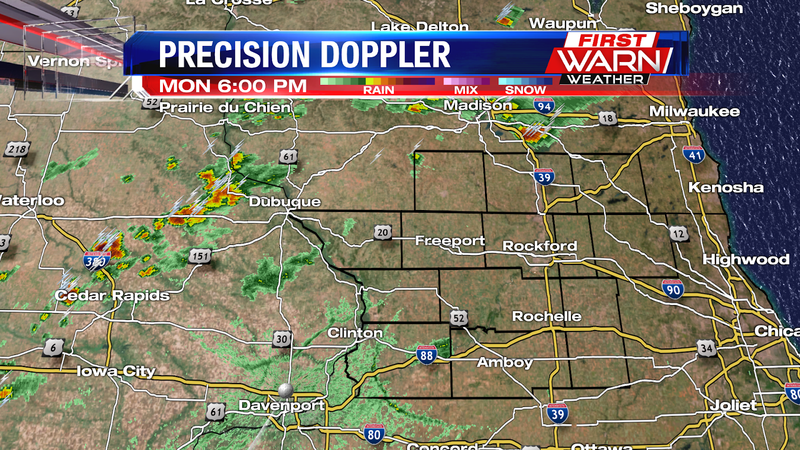 Biggest concerns for any thunderstorms locally will be heavy rainfall, but a few stronger storms over Iowa have produced gusty winds, small hail and even brief funnel clouds. 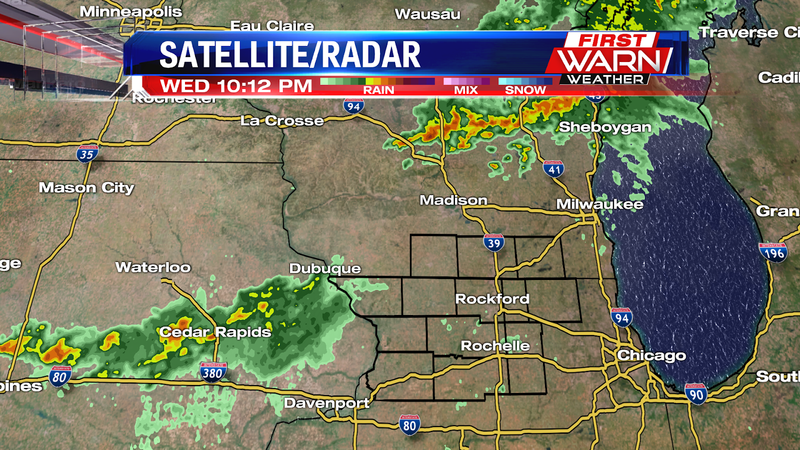 The isolated showers and storms will continue through the evening before skies turn partly cloudy during the overnight. Patchy fog will be possible through Tuesday morning with temperatures on either side of 60 degrees. While the threat for rain across the Stateline remains rather minimal and isolated this week, that's not the case for the east coast. After a dry weekend, the east coast was able to dry out some after heavy rain and flooding last week. Unfortunately the dry weather won't last for them, as more heavy rain is possible this week. It all stems from a pesky high pressure system located out over the Atlantic called a Bermunada High. This high pressure blocking low pressure systems and their cold fronts from continuing east ward. So, they stall over the east coast drawing in gulf moisture as they sit, and this leads to the multiple rounds of heavy rain. Like last week, this week will also hold the threat for potential flooding as more rain batters the area. While many in the Stateline may only get .25" of rain this week, just to our east over the Ohio River Valley 1-2" are possible. Further east over the southeast and east coast, 2-5" are possible! 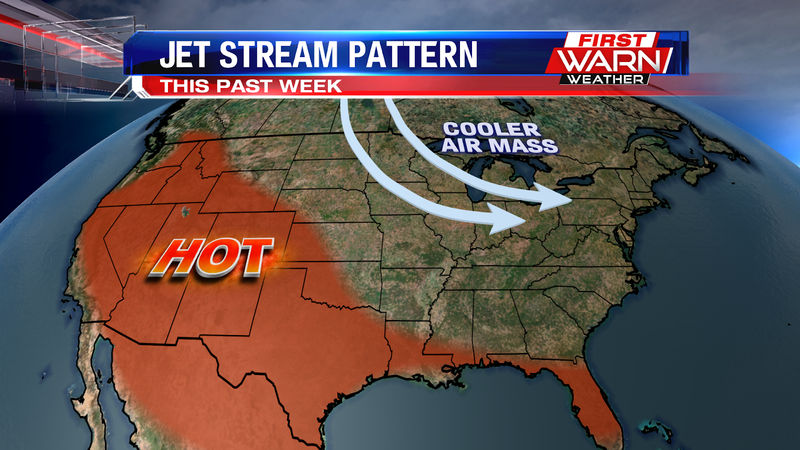 This pattern looks to linger through the end of the week and weekend. 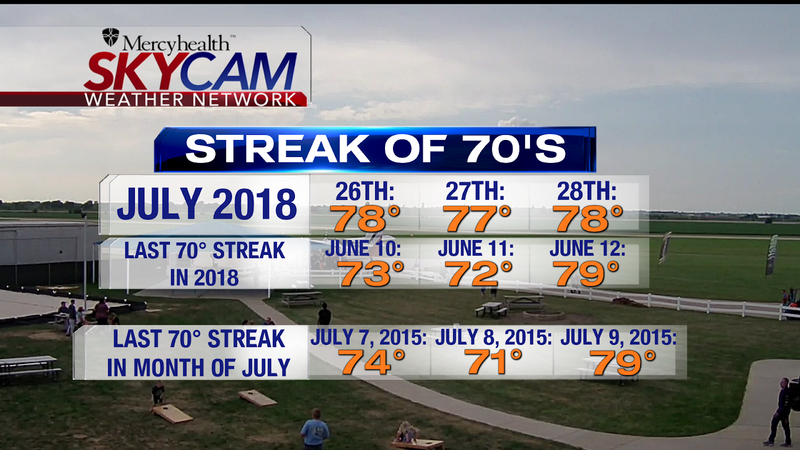 Another day stuck in the 70's.....in July! We've not had 3 consecutive days with highs in the 70's. 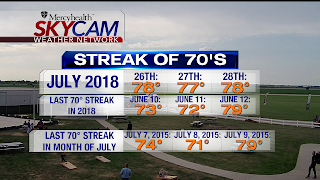 The last time this happened was in June of this year, with the last 70° streak occurring in the month of July happening back in 2015, from the 7th to the 9th. We're looking to keep the cooler weather for a while, but there will be a few 80° days sprinkled in the forecast. 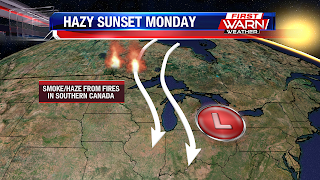 As for this evening skies will turn partly cloudy again after a weak frontal boundary developed out west, which lead to mostly cloudy skies for a while in the Stateline. Temperatures will be mild in the low 70's during the evening with low humidity. 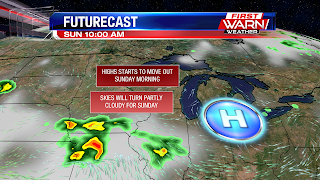 The high pressure system that started our trend of cooler weather will start to exit Sunday morning, but temperatures will still be cool in the upper 70's Sunday afternoon. 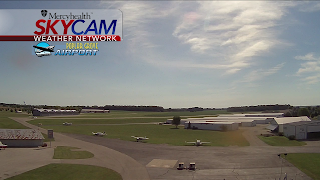 However, with the high moving out, more cloud cover will be expected during the day, but we'll still get some sunshine. 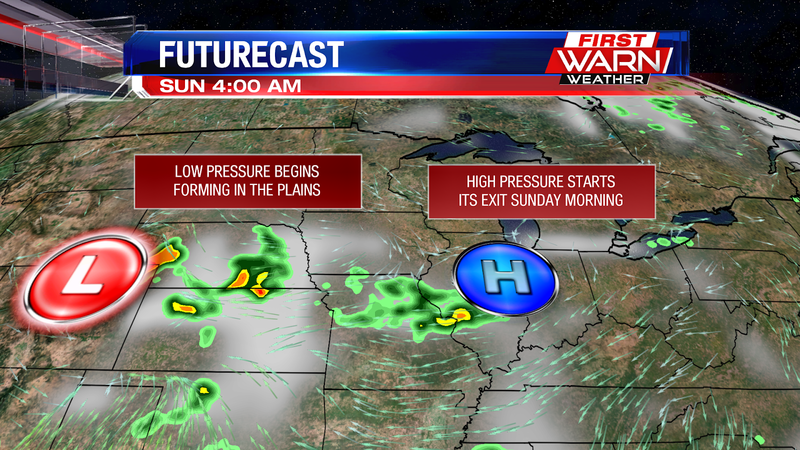 A low pressure system will develop in the plains while that high exits in the morning. 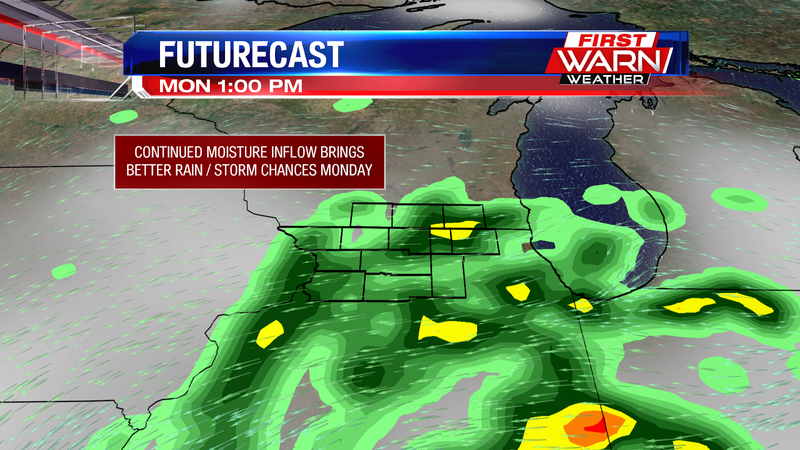 This will push moisture into our area, which will allow for showers to build up, but they'll mainly stay south of the Stateline. Anything that does develop over our area would be short-lived, but we can expect more cloud cover during the evening with the increase in moisture. Better rain chances arrive on Monday, when that low pushes a frontal boundary closer to our area. This will build up showers and a few thunderstorms for the morning and afternoon, but nothing is expected to be severe. The showers will help continue this cooling trend, with temperatures only expected to hit the mid 70's by Monday afternoon. Afterwards, everything starts to become isolated for Tuesday, with more thunderstorm chances to come Wednesday night into Thursday. Wednesday and Thursday look to be our warmest days next week, both days with highs hitting the low 80's. These were our temperatures during the afternoon...only in the 70's?! Usually we're in the mid 80's this time of year, but mother nature seems to find a way to balance things out. 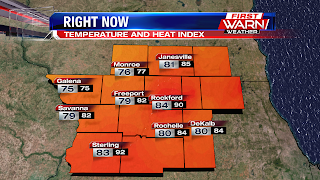 We've had a few heat waves during the summer, so it was only a matter of time before a cooldown moved in across the Stateline. This lasts for a while, but it does come with some rain chances. As we go through this evening our temperatures will be around 70°, before hitting the low 60's late this evening around 10pm. Temperatures will cool off quickly overnight, hitting lows in the low 50's during the overnight, so be sure to open your window to get some free A/C! 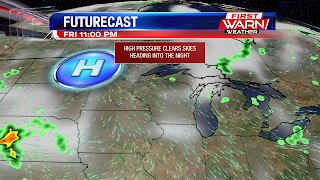 This high pressure system will keep tracking towards us as we go through the overnight and head into Saturday. It'll clear our skies and pull in cooler air from the north, which is why we'll be so cool overnight. 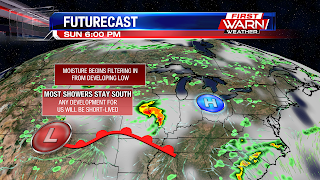 The cool inflow will also keep temperatures in the upper 70's tomorrow, but the high pressure influence will allow for plenty of sunshine too. 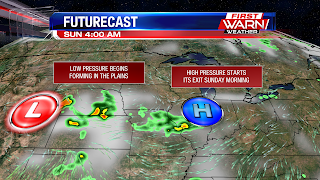 However, once we get into Sunday that High will begin to exit our area, and a low pressure system will begin forming out west in the plains. The Low will track towards us going through the day, but won't start influencing us until we get into the evening. As we head into Sunday evening, the Low will form a frontal boundary to our south, which will push more moisture into the area. This will allow for some showers to develop over our area, but luckily they're expected to be pretty isolated. Other than that, Sunday will be dry with partly cloudy skies in the upper 70's again. 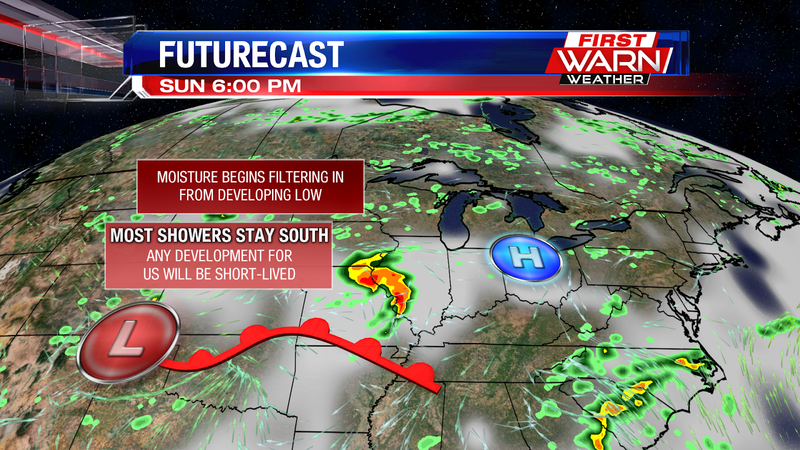 That same Low will bring better rain chances once we get into the work week, lasting through mid-week. 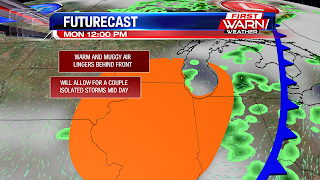 By Wednesday, temperatures will have warmed up again, bringing chances for some thunderstorms to our area when another frontal boundary passes by. Wednesday will be our warmest day on the 7-day outlook......a whopping 82°. Enjoy the cooler weather! 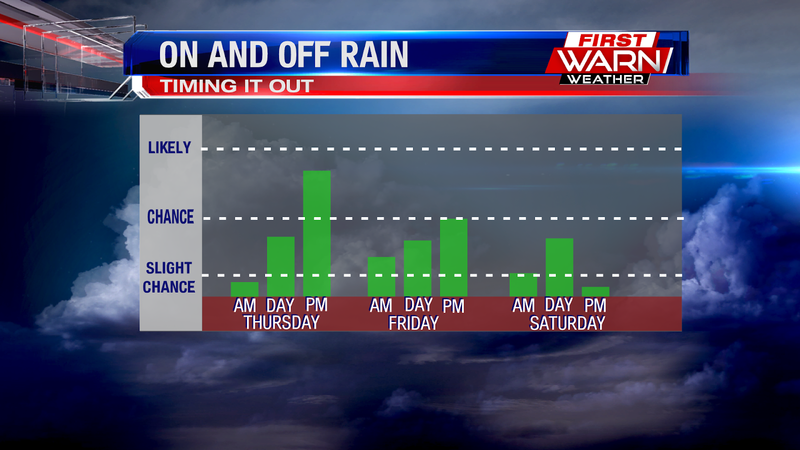 The threat for rain remains minimal over the next couple of days. 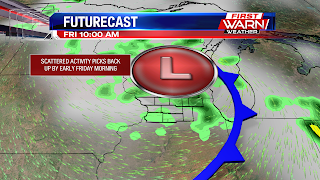 A long-wave trough over the Great Lakes will keep weak lift near by, and with weak energy passing through it, its possible for a few isolated showers this afternoon, and a very small chance for a shower on Friday. High pressure arrives on Saturday which will keep abundant sunshine in the forecast through the afternoon. However clouds will build late Saturday, turning mostly cloudy in the evening. This incoming cloud cover is due a low pressure system that moves out of the Rockies and into the Southern Plains Friday to Saturday. 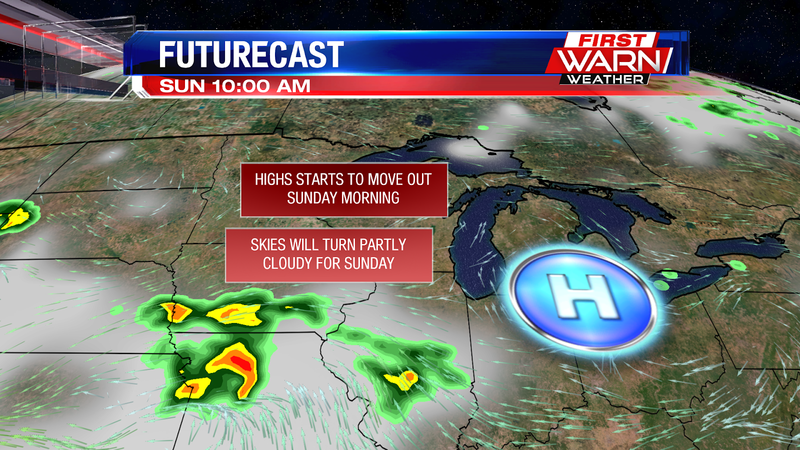 Going into Sunday, the low then moves into southern Illinois and Indiana. 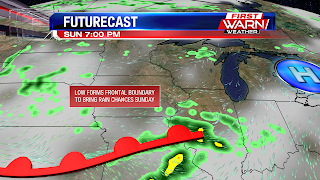 This low will pull it's warm front north into central Illinois by Sunday afternoon, which develops scattered showers across northern Illinois. 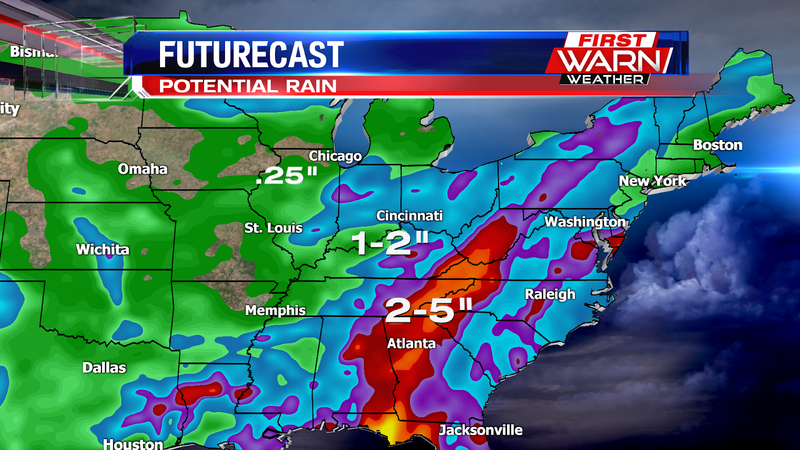 With this current forecast track, the heaviest rain and the most available moisture will be near the low. This will bring heavy rain, in excess of two inches, from eastern Oklahoma to Arkansas and far southern Illinois. Sitting to the north of the system, the rain we do get shouldn't add up to much. At this point we only look to get about .25" to .50" of rain Sunday. However, we keep small end chances for rain Monday through Wednesday. Long before the development of weather forecast models, people relied upon daily observations to help predict the weather. That's where a lot of our weather folklore has come from. On my way into work Wednesday afternoon, I noticed cirrus clouds moving in from the north. And cirrus clouds can actually give us an indication of what the weather *could* be like later that day, or in the days to come. Cirrus clouds (wispy looking clouds) are made up of ice crystals that originate from the freezing of super-cooled water droplets. Cirrus clouds generally occur during fair weather and 'point' in the direction of the air movement. 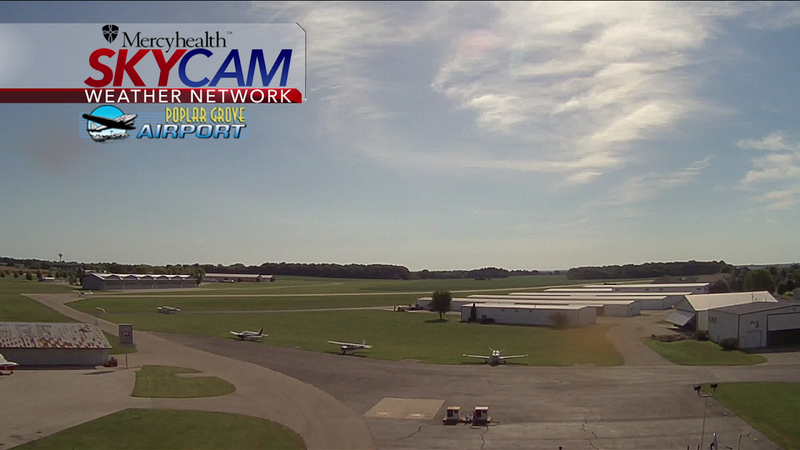 But cirrus clouds can also be an indication of a warm front moving in. 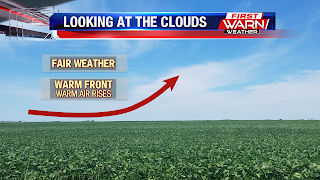 The leading edge of the warm front (warm air) can extend to nearly 30,000 ft throughout the atmosphere. As the warm air moves over the cooler air near the surface, it gradually rises throughout the atmosphere. As this occurs, the warm air cools some and begins to condense. Since this occurs at levels in the atmosphere where the temperatures are below freezing, cirrus clouds develop. As the warm front moves closer, those cirrus clouds turn into altocirrus clouds and then stratus clouds, which can eventually turn into rain. 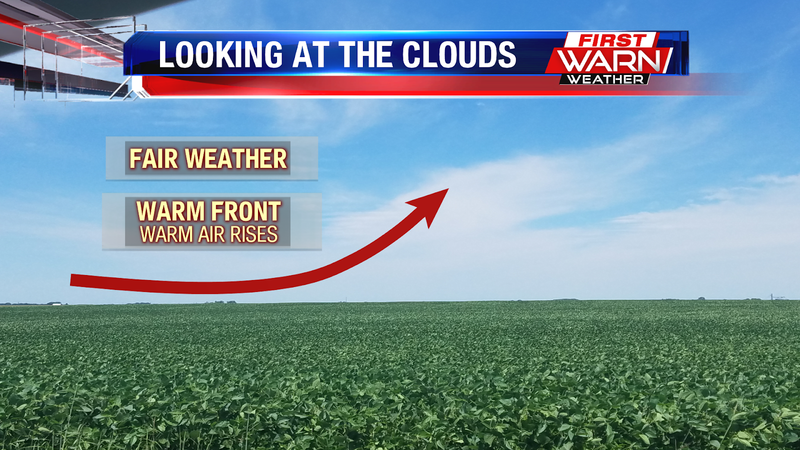 So the next time you look up in the sky and see those thin, wispy looking clouds, may close attention to the forecast. It could mean rain will soon arrive. 10:10pm Update: Stronger thunderstorms continue to move across Wisconsin Wednesday evening, while weaker storms move south in Iowa. 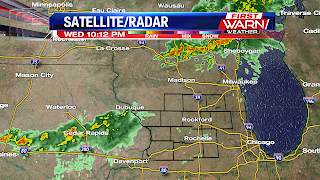 There may be a few showers that move through parts of Jo Daviess and Carroll counties, but it looks like our rain chance overnight continues to dwindle. 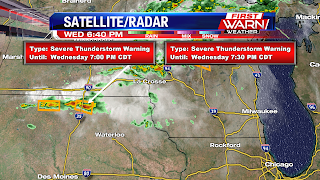 Severe thunderstorms have been moving through parts of Wisconsin, Minnesota and Iowa Wednesday evening, where a Severe Thunderstorm Watch has been issued. Greatest threats with any of these storms will be large hail and damaging winds. The storms to the north are forming along and ahead of a cold front that will continue to move southward through the night, reaching northern Illinois after Midnight. By that time, the energy in the atmosphere will be much lower than what it is to the north. In fact, many of our models show the thunderstorms weakening quite a bit tonight. I still do think there will be a few scattered showers and isolated thunderstorms around, but we're not expecting any severe weather tonight. Rainfall totals tonight are expected to remain under a quarter of an inch. typically continue to move out over the Atlantic. But there has been an expansive high over the Atlantic that is blocking the fronts, and keeping them from moving east. That in turns keeps the moisture and rain over the same area, and with already saturated ground, any extra rain could allow for some flooding concerns. 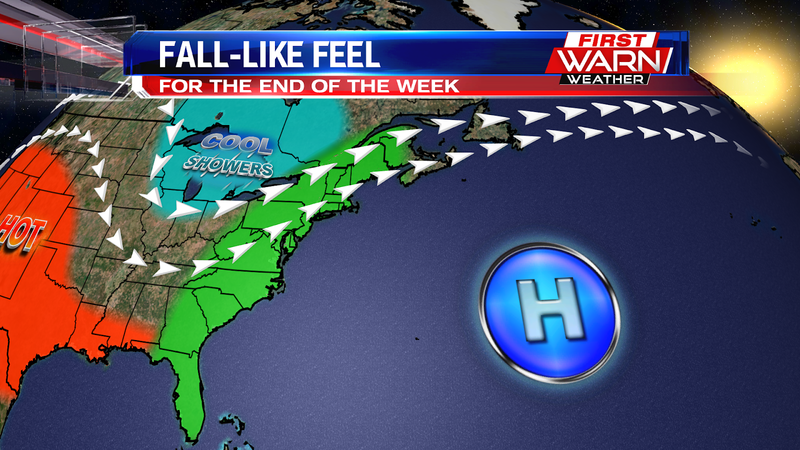 The high should break down some by the end of the week, that could help the area to dry out some this weekend. 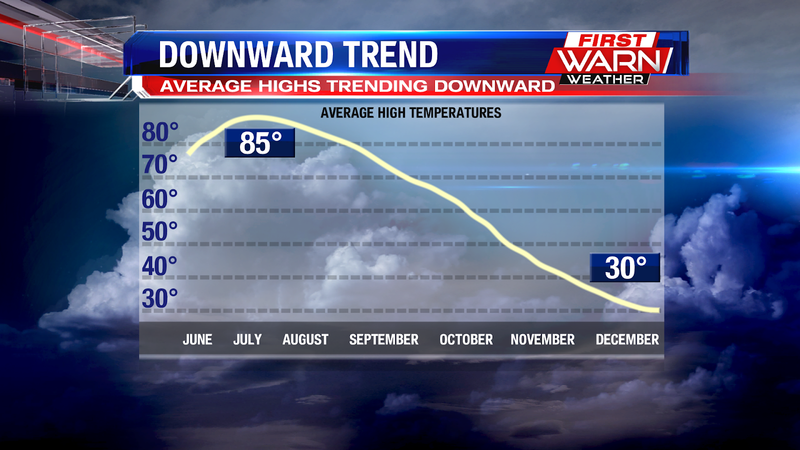 The average high temperature for Rockford peaks mid July, warming into the mid 80's (85 degrees to be exact). But that number is beginning to fall, and will continue to do so until the end of the year. By the time fall begins on September 21st, the average high will have fallen to 73 degrees. 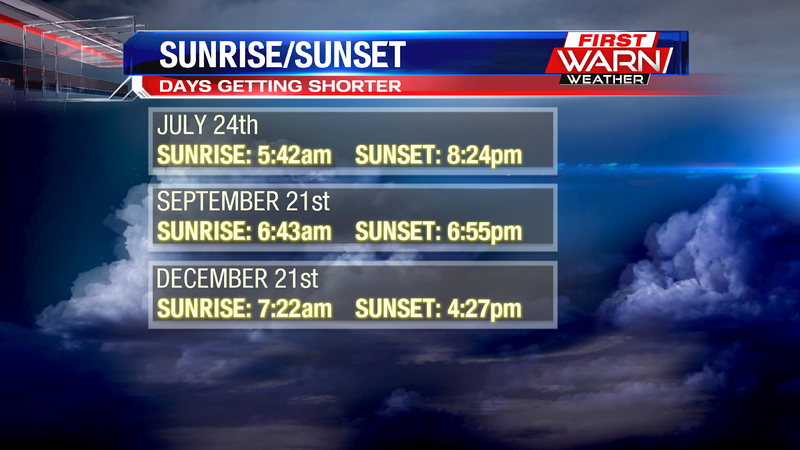 And by the time the Winter Solstice arrives, the average high will be right around 31 degrees! Not only are we losing ground with the temperatures, but in daylight too. 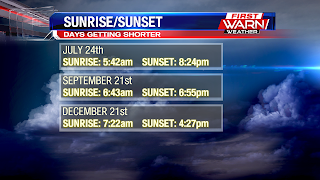 The sun came up today, July 24th, at 5:42am and set at 8:24pm. But on December 21st, the Winter Solstice, the sun will rise at 7:22am and set at 4:27pm. On the bright side, days slowly get longer after December 21st. You may have noticed the afternoon and evening sky having a little more of a hazy look to it Monday, and a little more of a red glow with the setting sun. The haze-filled sky was a result of wildfires burning in southern Canada. 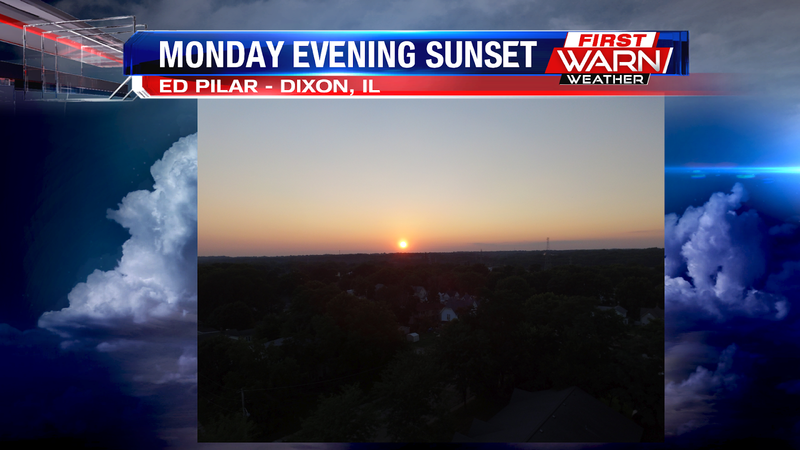 Ed Pilar captured the sun setting Monday evening over Dixon, haze on the horizon with the sun holding a red glow. Persistent northeast winds from low pressure east of Illinois pulled the smoke south over much of Wisconsin and Illinois during the day. 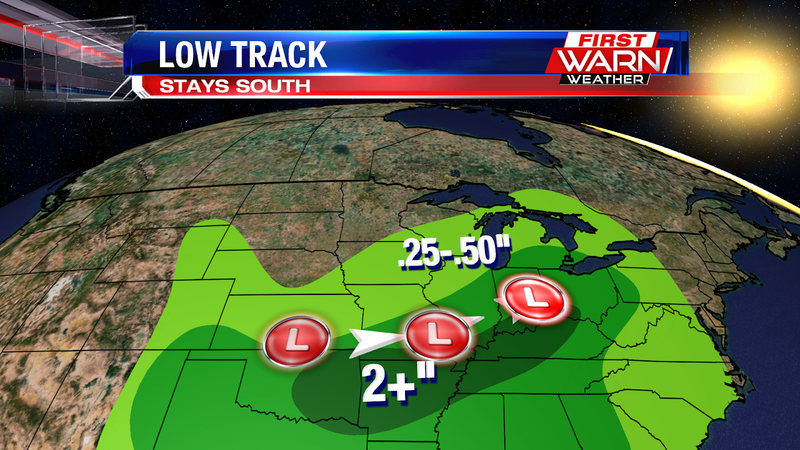 A shifting jet stream pattern Tuesday kept our upper level winds more from the northwest, versus northeast. 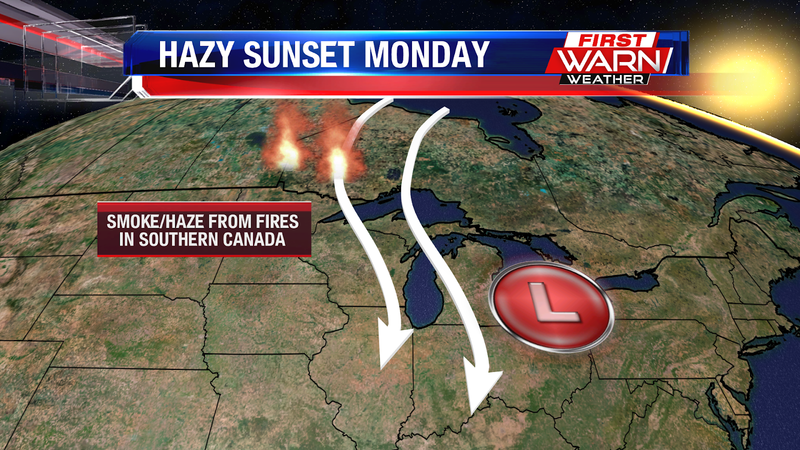 But a quick look at visible satellite Tuesday evening does show haze and smoke filling the skies over the Upper Midwest. It will be a beautiful July day today, with forecast highs just slightly above average. Humidity will remain fairly low today, with a good amount of sunshine! There is a slight chance for a shower this afternoon, but overall most end up staying dry. The heat continues across the southwest, yesterday Phoenix hit 115°, and today could be even hotter! 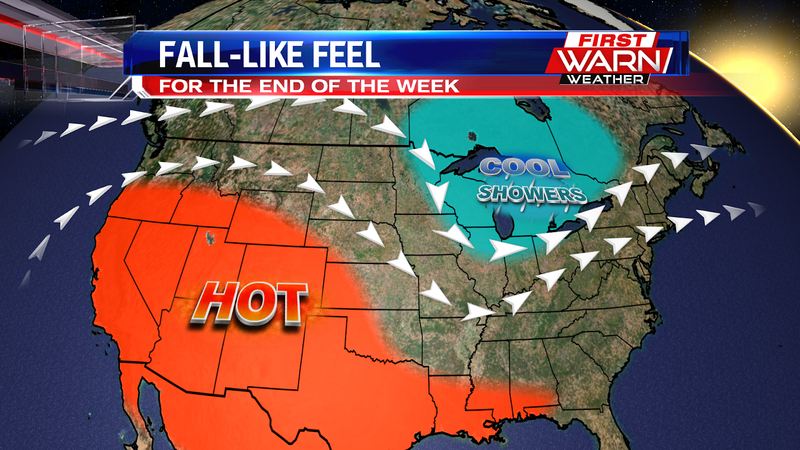 They remain well into the 100's this week, but in the Stateline our temperatures tumble by Thursday and Friday. A stronger cold front will come through Thursday, and while it could bring some rain Thursday morning, the bigger story will be the cooler feel we will have by the end of the week. 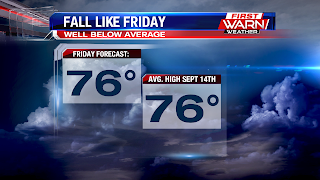 Temperatures by Friday only make it to about 76° with cold air arriving behind the front. That is about 10° cooler than today's forecast high, but its also the average high of the middle of September! So it will have a fall-like feel Friday afternoon, but temperatures begin to climb again this weekend, and we're back to 80° on Monday! 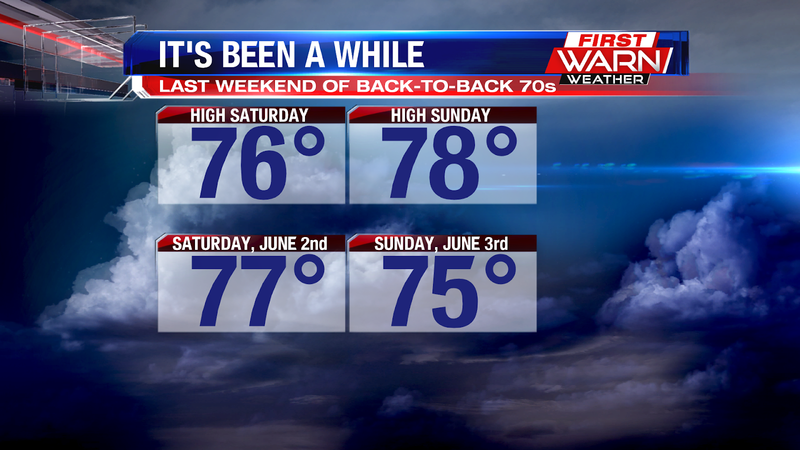 High temperatures both Saturday and Sunday only warmed into the mid 70's! Not quite the weather we're used to during the month of July. 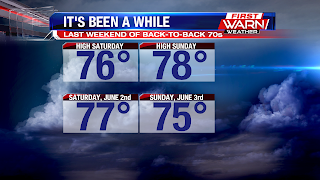 While there have been some cooler days this month, we have to look all the way back to the beginning of June to find back-to-back weekend days where the high temperature was in the 70's. 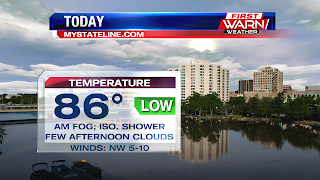 Temperatures for the beginning of the week will warm back into the low to mid 80's, closer to average, but a strong cold front will move through during the day Thursday. This will bring temperatures for the end of the week, and weekend, back down into the upper 70's. 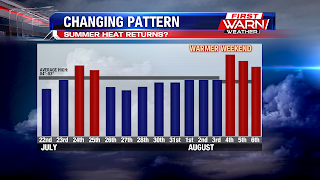 It looks like this pattern will last through the end of the month, and quite possibly into the beginning of August. 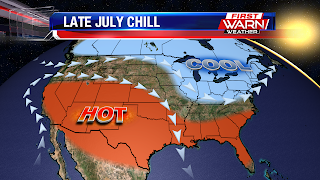 A strong ridge of high pressure will continue to bring heat over the southwest and west, while the jet stream dips to the south from the Great Lakes to the East Coast. Temperatures over the next two weeks could average close to ten, perhaps even fifteen, degrees below average - especially by the end of the month. Severe weather headlines have taken a front seat in the news lately. From the numerous tornadoes in Iowa, to the boating tragedy in Branson, MO, the McHenry County woman getting struck by lightning at Country Thunder, and now another capsized boat possibly due to thunderstorms in Florida. While we can't stop thunderstorms from occurring, there are steps we can take to prevent falling victim to severe weather. Benjamin Franklin once said "By failing to prepare you are preparing to fail". If you wait to prepare until severe weather, or another natural disaster, occurs it may be too late. There are four important steps you need to remember when preparing for severe weather. They are: Plan, Practice, Monitor, Act. Knowing where to find shelter during severe weather, where to meet up with family or friends and how to communicate with each other are key in severe weather preparedness. Whether it be at home, work, school, church or at an outdoor function. If you know you will be away from home at a sporting event, or enjoying a summer afternoon on a friend's boat, make sure you're also informed of where the severe weather safe places are, and how to get to them. Make sure you're able to gather weather information quickly, and have multiple ways to receive that information. That may be through your cell phone, local media or the National Weather Service. It's also important to know the difference between a 'Watch' and 'Warning'. A 'Watch' means conditions in the atmosphere are favorable for severe weather and you should continue to monitor the weather throughout the day. A 'warning' means severe weather is occurring or about to occur shortly, and you should seek shelter immediately until the warning is over and the storm has passed. Once your plan is in place, it's time to practice it. You've designated where the safest place in your home, office or school is located - now you need to practice getting there. Holding monthly or yearly practice drills, making sure everyone knows where the safe place is located, how to get in touch with others and where to meet up once the storm has passed. During natural disasters it's often times better to text someone, rather than call. Whenever I give big weather talks to groups or clubs that hold outdoor events, I always stress the importance of having someone who is able to monitor the weather. This person is your 'weather watcher', so to speak. Knowing what the weather will be and monitoring the weather is extremely important not only for people at home, but for those who may be out at big outdoor events, concerts, recreational boating events, etc. Having someone monitor the weather, and then relay back to those who are in charge of making decisions is very important in preventing severe weather tragedies. Especially with outdoor events. Be sure to have multiple ways to receive weather information - whether it be your phone, weather radio, TV, radio, etc. 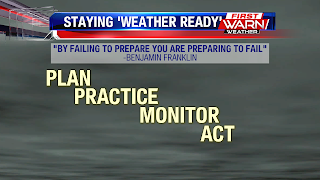 Ideally a 'weather watcher' will be someone who is in charge of activating the severe weather plan, and who can make decisions on where people need to go for safety. But it's also important to remember that once given that information, action needs to be taken. There is only so much a Meteorologist can inform you on - storm warning, direction, areas impacted and threats. It's up to YOU to take that information and ACT on it! 'Get in, get down and cover up'. That's the advice from the National Weather Service. When a warning is issued, whether it be tornado or severe thunderstorm, seek shelter immediately. Move away from windows, get into the lowest level of your home or office (or designated safe place area) and protect yourself from possible falling debris. While not all severe weather fatalities can be prevented, there are steps you can take to help protect yourself. Staying aware of the weather around you will keep you from saying 'the storm came out of nowhere'. 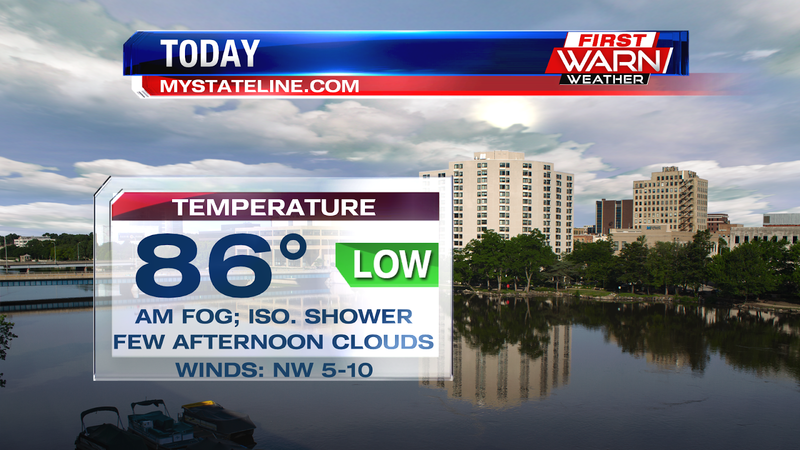 Other than a few brief-pop up showers it turned out to be a fairly nice afternoon with a few peeks of sunshine. This helped temperatures to warm up a bit more into the upper 70s too, but now we've got more isolated showers pushing through the area, which will keep skies cloudy for the evening, but luckily we're nearly back on track for where we're supposed to be at with rain totals. 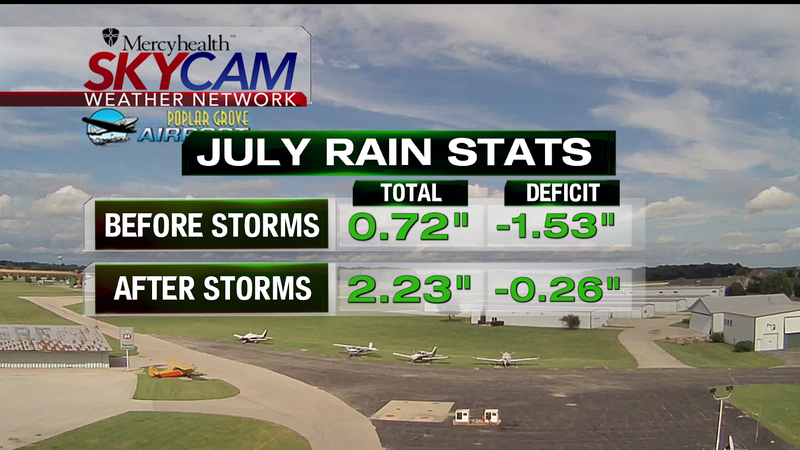 Before the storms moved through Thursday night, we were just over a 1.5" deficit. 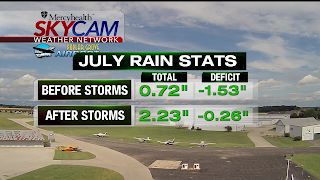 The downpours, while unpleasant, did help get our numbers back up, now only sitting at a deficit of a quarter of an inch. As we go through the evening, isolated showers will continue for the early portion of the evening, as everything is expected to dry up by 10pm. Everything stays dry for the overnight, and any rain that moves towards our area will stay to the east or fizzle out before reaching us. Not all the moisture will be gone though, as muggy conditions are expected during the overnight with dew points in the mid 60's, with warm temperatures around 70°. Dry air starts sinking in on Sunday, but a brief pop-up shower will be possible mid-day, otherwise we're looking dry. Cloud cover will be similar to today, with mostly cloudy conditions and a few peeks of sunshine. Temperatures will be in the upper 70's again during the afternoon. 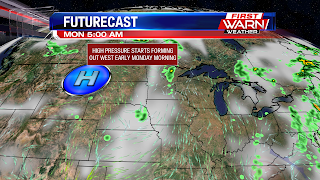 Once we get into the work week, a high pressure system will form in the northern plains and push more dry air into the area. This will bring the sunshine back, along with warmer temperatures in the mid 80's. 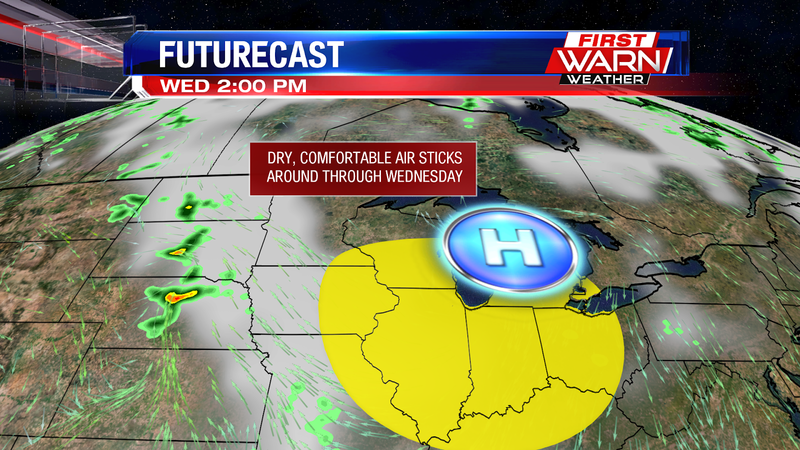 We keep those same conditions until Wednesday, when thunderstorms chances start going back up for the Stateline. 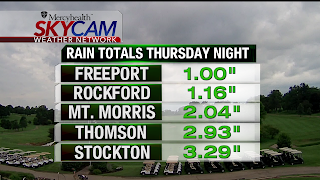 Rain has made quite the presence across the Stateline since Thursday night, as some spots have picked up over an inch of rain. The heavy downpours allowed for these locations to pick up the rainfall quickly, with Stockton seeing the most rain in a short time period of over 3 inches! 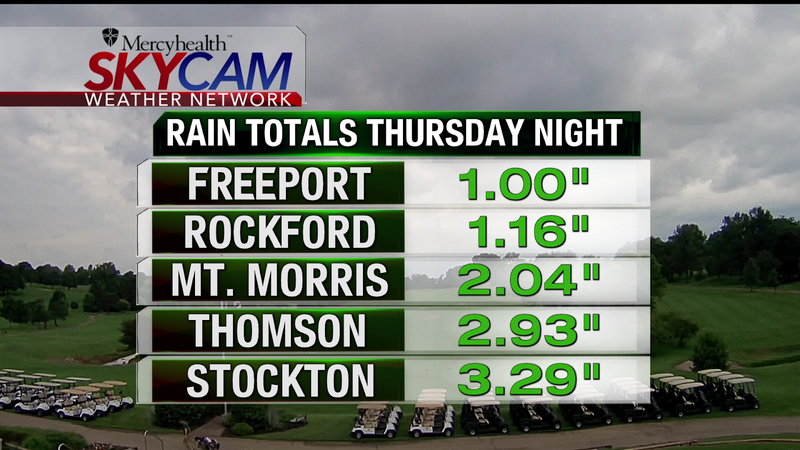 Rockford picked up a little over an inch of rain, and Freeport picking up just an inch. The isolated showers will continue for this evening and overnight. With all the moisture content, patchy fog will develop overnight, some of which will be dense, so do be cautious when out on the roads late tonight. Most of Saturday will have isolated showers still pushing through, but once we get into late afternoon some drier air will start filtering in from the north, pushing the rain out of the area. 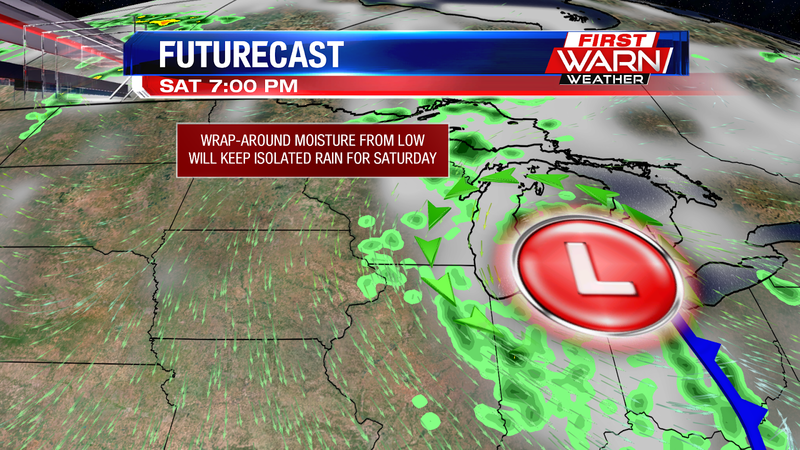 This will help us stay mostly dry for Saturday night, and even stay dry for the rest of the weekend. However, the low's presence will still allow for cloudy skies through Sunday evening. 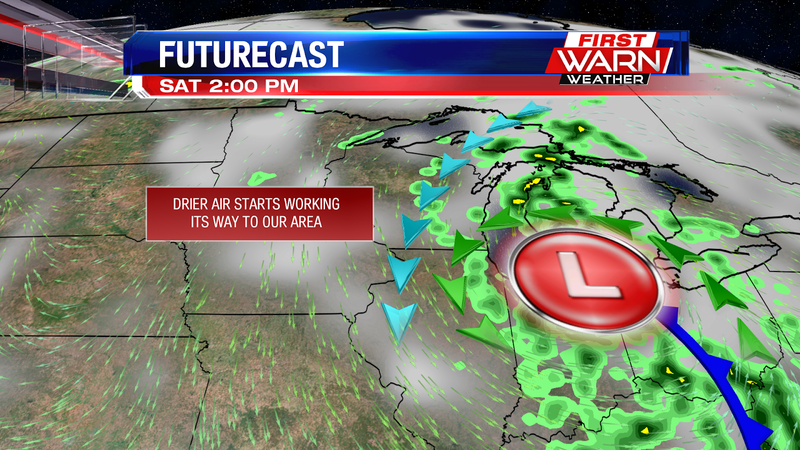 Once we get into the work week, sunshine will return as the drier air will keep filtering into our area. This will also keep temperatures more mild heading into next week, staying around 80° towards the beginning of the week, but warming back into the mid 80's by Tuesday. Yesterday tied the second most active tornado day this year, with a preliminary 28 tornado reports recorded across Iowa and other portions of the Midwest and Plains. 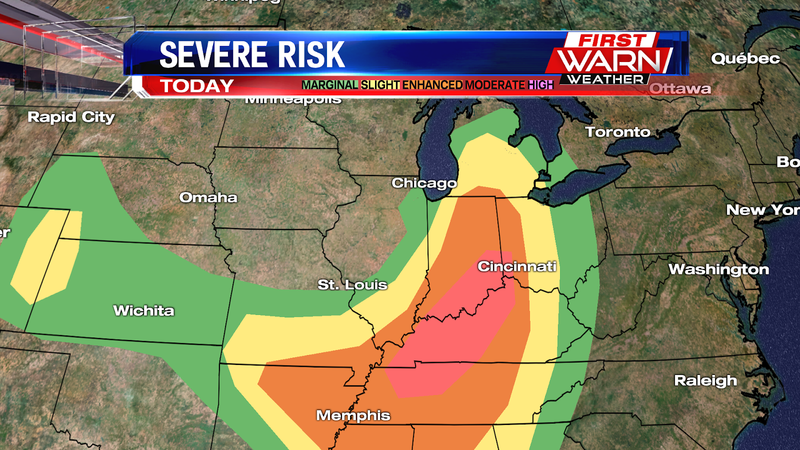 Today will be another day to watch, with more severe weather expected. Today, the threat has shifted ahead of a cold front, and is positioned over the Ohio River Valley. An enhanced and moderate risk for severe storms has been issued by the Storm Prediction Center for areas including most of Indiana, Kentucky, and Tennessee. 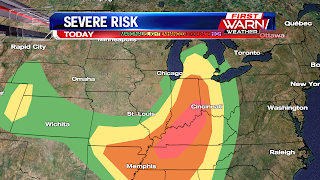 Large damaging hail, strong damaging wind gusts, and tornadoes will all be possible as storms develop this afternoon, (especially in orange and red areas). If you have friends or family in that area, you might want to give them a heads up so they can be prepared should/when warnings get issued. Locally, scattered showers and embedded thunder is over the next couple days are possible. Rain will be rather light, but at times will pick up to turn more moderate to briefly heavy, in any storms we do get. 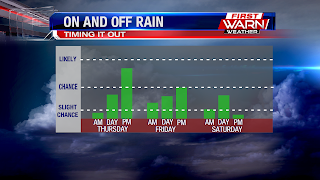 On and off rain chances continues through the evening and into Saturday. A few isolated chances remain through early Sunday. We had some showers move through during the afternoon, the only shower remaining is in northern Dekalb County pushing into McHenry county. 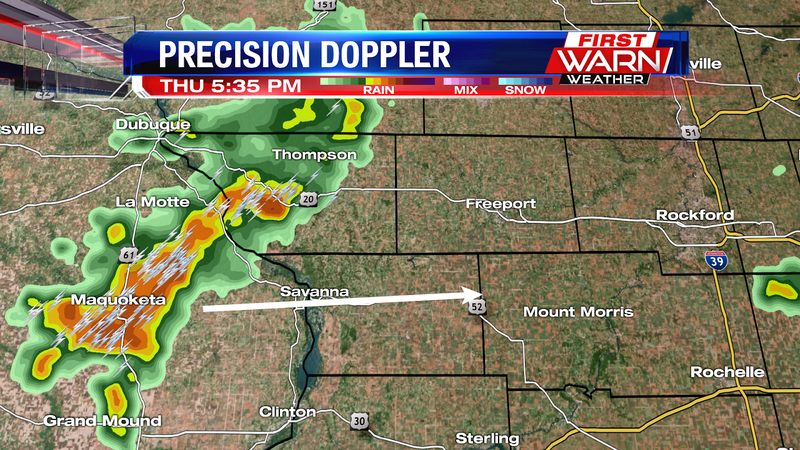 Now we've got thunderstorms pushing in from the west, some of which are on the strong side. These will continue to push eastward as we go through the evening, and if you live out west there are a couple of things to watch out for. The main threats for these storms will be downpours and strong winds. Jo Daviess and Carroll counties have the best chances for seeing these, as the storms will gradually weaken afterwards as they push eastwards. We'll have a few storm systems move through during the evening, but after 7pm the potential for anything severe goes down. 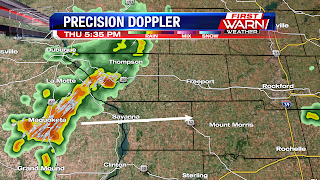 As these storms weaken while they track east, a brief strong wind gust will be possible east of Jo Daviess and Carroll counties, but otherwise the storms will weaken quite a bit, and eventually become isolated during the overnight. This low pressure system to the north will allow the rain to become more scattered again by early Friday morning. 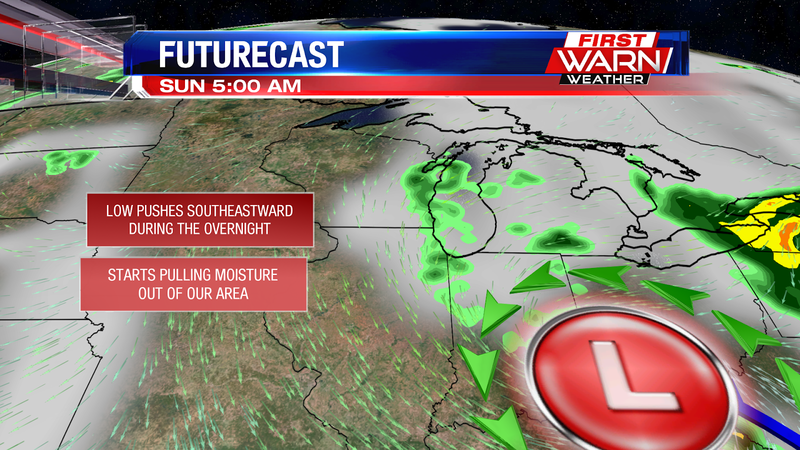 That low will slowly track eastward heading towards the weekend, keeping on and off rain in the area through Saturday. 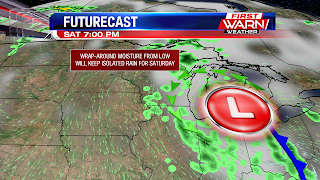 However, once we reach Saturday evening, rain chances will nearly be gone, as this low begins its exit from our area, taking the lingering moisture with it. Afterwards, some dry air will move in from the north, but clouds will linger and keep the sunshine fairly low for the end of the weekend. 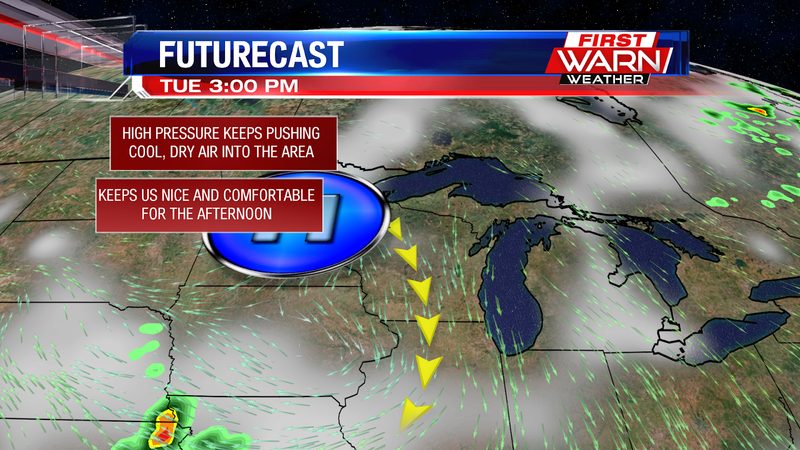 A picture perfect Wednesday on tap for us today, with high pressure centered over Lake Michigan. 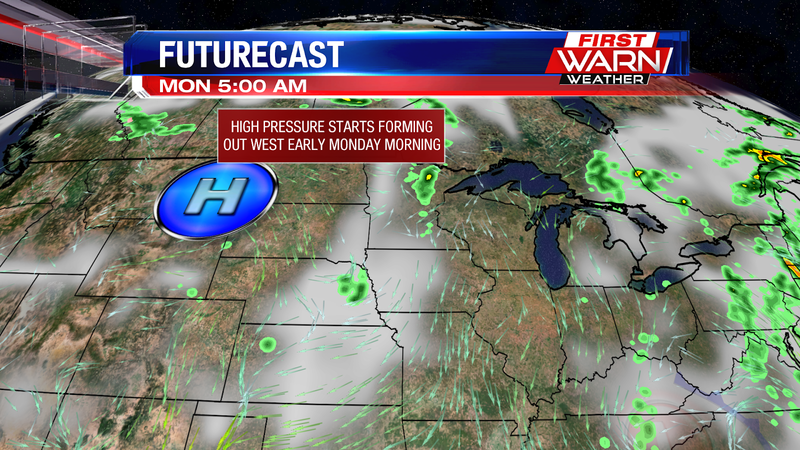 Today, a disturbance moves out of the Rockies and develops into a low pressure in the Plains. Low pressure will move into Minnesota and Wisconsin through Thursday, and will develop rain and storms to our west in the afternoon. 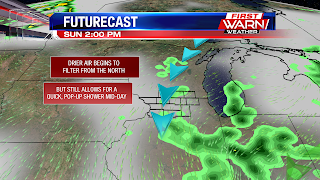 Its possible for a few showers to hold together Thursday afternoon and make their way east into the Stateline late day, but the coverage doesn't look to be much. A higher chance for rain and thunder arrives Thursday evening as another round of storms develops east and moves into the area. Again they will be weakening but should hold together to bring a threat for a few scattered showers and storms overnight. The rain threat will clear Friday morning with the cold front passing to our south in the morning. There is a chance for showers and some thunder to develop again Friday afternoon, but higher coverage will be to our south with higher instability in place. 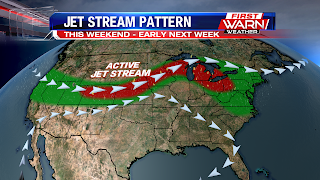 As low pressure passes to our east, along with an upper level trough, a few showers or a rumble of thunder will be possible Saturday and Sunday. While the threat for rain lingers through the weekend, it won't be a washout by any means. 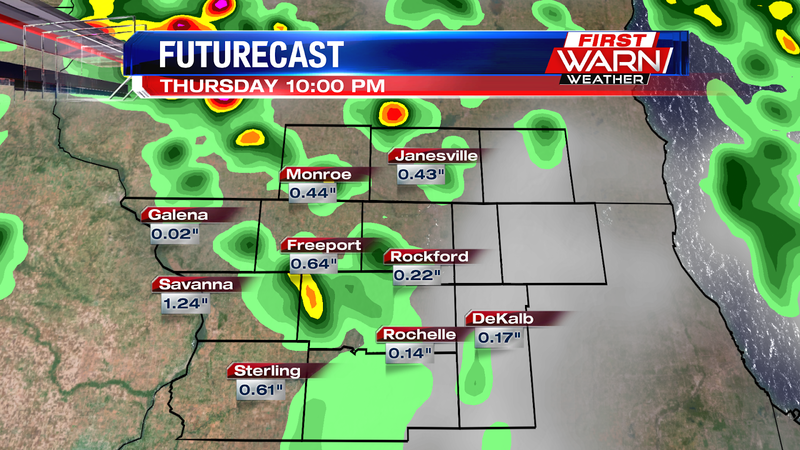 The highest chance for rain will be Thursday evening into Friday with mainly light isolated chances into the weekend. 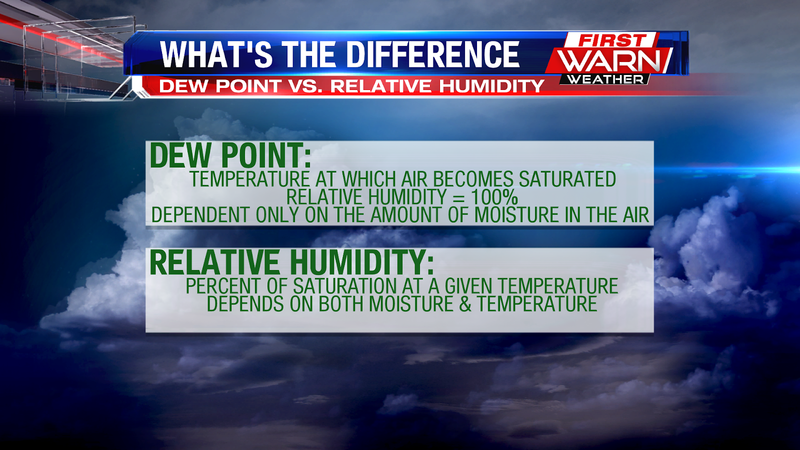 Do you ever wonder what the difference is between dew point temperature and relative humidity, and why meteorologists focus more on the dew point temperature rather than humidity? It's because the dew point temperature is a more accurate way of showing the amount of water vapor in the air, and the impact it has on our comfort level. For example, if both the air temperature and dew point temperature are at 60 degrees, the relative humidity is equal to 100 percent. But when the temperature is 100 degrees and the dew point temperature is 70 degrees, the relative humidity is about 40 percent. The relative humidity in this case is lower because it represents how much the atmosphere is saturated at a certain temperature, whereas dew point temperature represents the temperature at which air becomes saturated. The warmer an air mass becomes, the more moisture it is able to hold. So even though the relative humidity is 100 percent when both the air and dew point temperature are at 60 degrees, it feels more comfortable than when the air temperature is at 100 degrees and the dew point temperature is at 70 degrees. Anytime the dew point is higher than 60 degrees, it begins to feel uncomfortable. What a beautiful Tuesday morning! 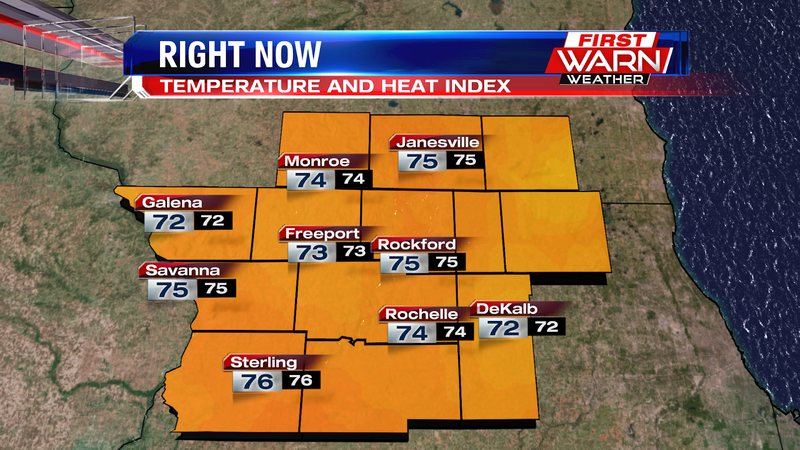 Temperatures in the low 70's now across the Stateline, but you may have noticed it feels much more comfortable outside! Dew points are more mild around 60°, and they'll stay that way the rest of the day. This nice weather doesn't last forever though, as thunderstorms will make a presence this week. As we go through today, a high pressure system will track down from the north, continuously pulling cool, dry air into the area. This will keep temperatures in the low 80's during the afternoon, and keep the low humidity too. A few clouds will move on through this afternoon, but even then we'll still be sunny. Once we get into the evening any lingering clouds will dissipate, as that high sinks into the Stateline for the overnight. As it does so, it'll get access to more cool air, which will end up bringing us into the upper 50's during the overnight, with rural, flat areas dipping to the mid 50's overnight. A little bit of patchy fog will also be possible during the overnight as temperatures will be cooling off quickly, but it'll still feel comfortable outside. You might even want to open your windows to get some free air conditioning! That high will be sitting just northeast of us for Wednesday, and we'll see the same conditions that apply for today, the only difference being less cloud cover. You'll want to take advantage of the nice weather today and Wednesday, because once Thursday arrives we'll have a low pressure system track into the area, which will bring in some thunderstorms for Thursday afternoon. These will last through the overnight into Friday morning, and some thunderstorms may pack a punch. Other than the thunderstorms, things look dry this week, with cool and comfortable conditions in store the rest of the week. Temperatures will only be in the mid to upper 70's this weekend, with a passing rain shower possible on Sunday. A warm and muggy start to our work week with temperatures in the upper 70's to low 80's this morning. 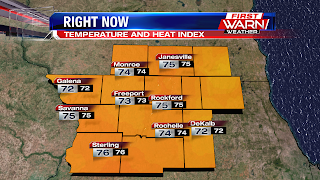 Dew points are in the low 70's too, and this will only intensify the heat as we go through the day, bringing heat indices into the mid 90's for some spots this afternoon. 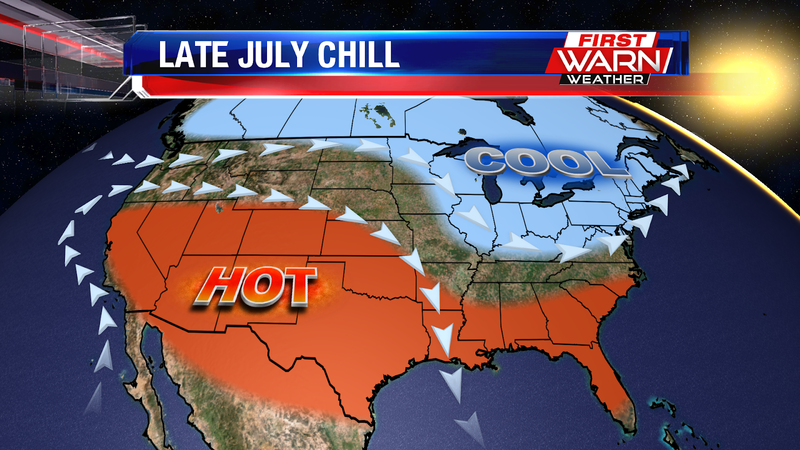 However, a relief is on the way, so we don't have to deal with the warm, humid weather much longer. As we go through the day, a weak frontal boundary will move through the Stateline area. A cold front sits to the east, but there's plenty of heat and moisture lingering behind it, along with the small frontal boundary. 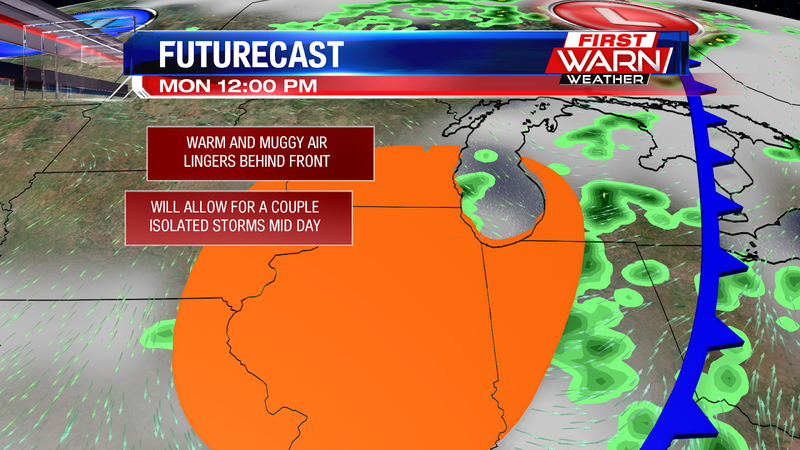 This small boundary will allow for some isolated thunderstorms mid-day, with clouds increasing through late morning. Other than the isolated storms mid-day, we stay dry heading into the afternoon, with skies gradually clearing heading into the evening. 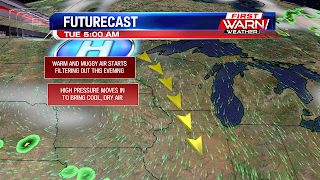 Once we get into late evening, a high pressure system will begin tracking towards our area from the northwest. This will push some cool, dry air into our area, drastically lowering our humidity and cooling our temperatures as well. We'll eventually cool to the low 60's overnight, with low humidity lasting through the overnight as well, so be ready to open those windows! That high stays close-by for Tuesday and Wednesday, allowing for plenty of sunshine with cooler temperatures around 80°, all while keeping the low humidity. 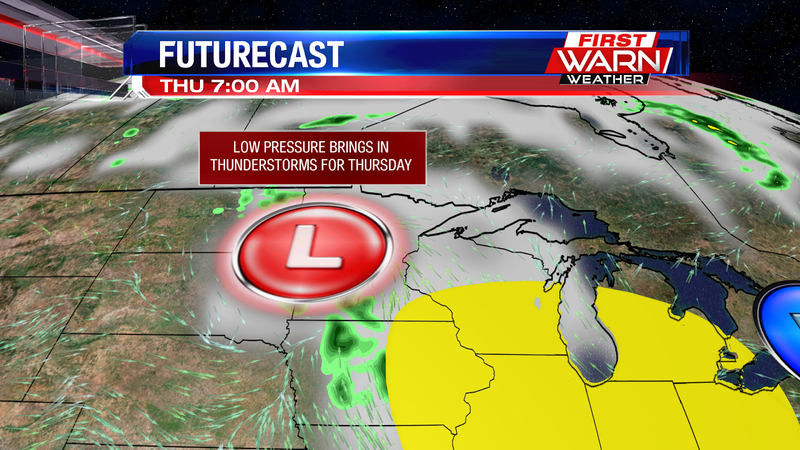 Thunderstorms will return to the area though once we get to Thursday, some of which may be on the strong side. 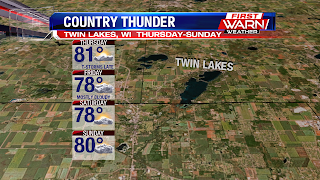 This may cause some issues for those of you heading out to Country Thunder later this week. 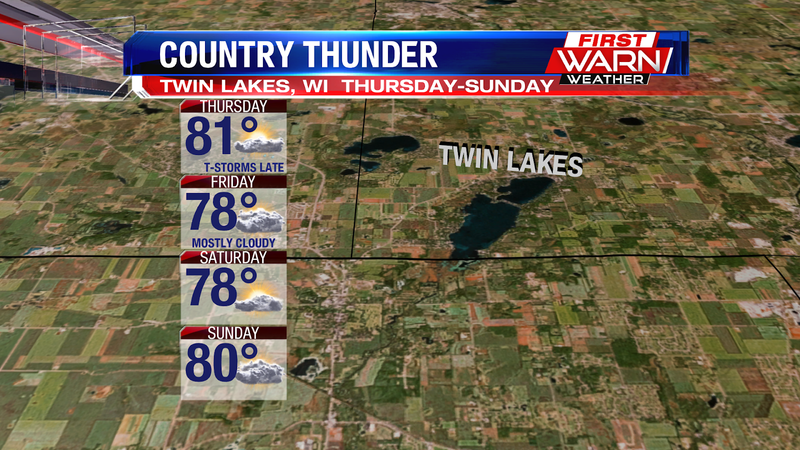 However, other than Thursday the weather's looking good for Country Thunder, as temperatures will be in the upper 70's! 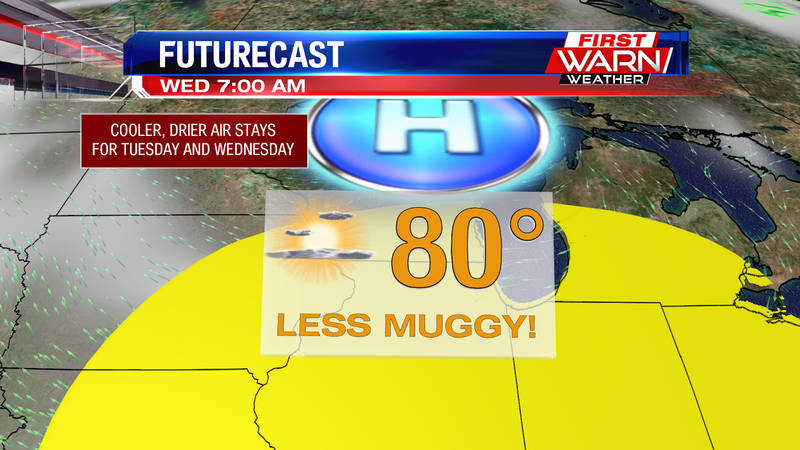 Humidity will stay low too, so enjoy the nice weather at the event or any other area of the Stateline this weekend.